Let's do more than just fix injuries. Removing knots. One adhesion at a time! Whether you’re in need of tension release following a long day in front of a computer, or a massage that digs deeper into the muscles following a hard week of training, Onsight Chiropractic has the techniques to put you back together. Sonja Gubalke, Amy Hale, and Amanda Upchurch have a combined 20 years of experience in their art form. From 1 to 2-hour options, their attuned hands will create palpable openness and ease in your body. You’ll leave feeling both worked and relaxed—in a good way! Massage Therapy equals a happy you! You’ll leave feeling both worked and relaxed—in a good way! 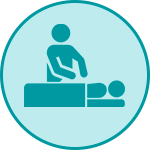 We offer competitive rates for massage therapy: Use the Book Now button throughout the website for more detailed information on appointments and scheduling. Here is a short list of just some of the more common massage therapy treatments and techniques we use to help you on your road to recovery. By definition, Trigger Point technique is the utilization of static pressure on specific spasm points to relieve pain. This technique manipulates the soft tissue of the body (muscles, tendons and connective tissue) to balance the central nervous system. Myofascial release (or MFR) is a hands-on deep tissue method that treats skeletal muscle immobility and pain by relaxing contracted muscles, improving blood and lymphatic circulation, and stimulating the stretch reflex in muscles. Lymphatic massage, also called lymphatic drainage or manual lymph drainage, is a technique for treatment of lymphedema, an accumulation of fluid that can occur after lymph nodes are removed during surgery. The therapist gently rubs, strokes, taps or pushes the skin in directions that follow the structure of the lymphatic system so that accumulated lymph fluid can drain through proper channels. Lymphatic drainage is very gentle, is not painful and doesn’t have a stimulating effect. Our massage therapists as well as our chiropractors are trained in myofascial decompression using a cupping technique. The process involves lifting the skin upward by the vacuum created inside plastic cups. Your therapist will either slide or hold the cups still for several minutes in one region to increase blood perfusion, needed to maintain a healthy muscular system. The effect can feel great and also leave visible red circles that may take 7-14 days, on average, to fade away from your skin.